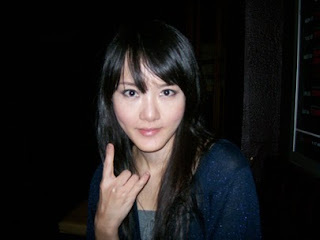 Her name's Doris Yeh, and she plays black metal. This is her band, Chthonic, in full black metal regalia. And here's a video of their song "Forty-Nine Theurgy Chains." Sounds like a bunch of Cradle of Filth worshippers. Which isn't a bad thing for someone like me who digs CoF (at least, their first few albums). It just shows that there's more to this group than just a sweet-faced bassist. So hey, they got me at hello.